When we want to add new functions. When we want to use a default function and make few changes in the functional flow. When we want to build a VFP that applies for user permissions, even-after a controller extension executes in system mode. How extensions can help you build advanced Visualforce Pages? As discussed in the previous articles, Extensions has several benefits, it can have standard & custom controllers. 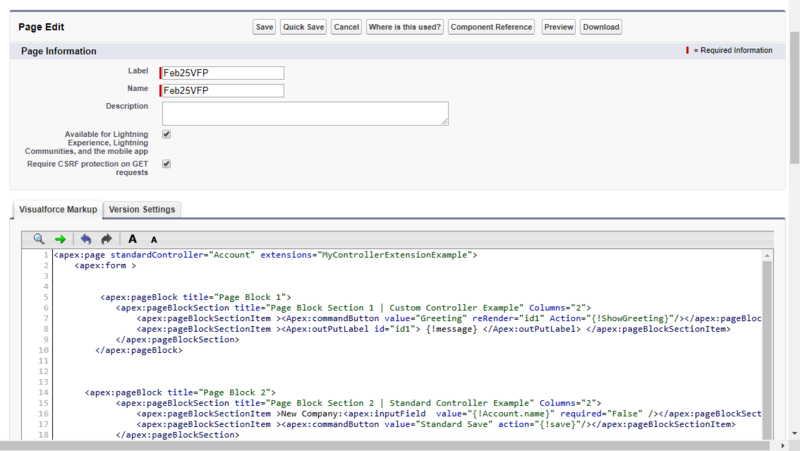 In Extension we can have one standard or custom controller and can have multiple classes. There are various scenarios in which we can use the extension. We have a business scenario in which the standard & custom extensions should be explained in the Visualforce Page and the DML including in the Visualforce Page also. On pressing the button available on the screen, it will hit the APEX class and retrieve the message saved in it. Note: By default, Objects has 2 things that are common, the data and the save, delete, edit, and other functions. On button press, the data will be saved to the Default “Account” Object. Note: On button press, the code hits the Apex Class which is already saved by name “MyControllerExtensionExample5Feb” and with variable name(binding between the Apex Class & Visualforce Page) “VariableForStoringAccountName” and executes the code written in it and saves the data in Account Object. In the next topic, we will discuss in-detail about “Batch Class in Salesforce”. Keep following us for more info on Salesforce Development / Programming.